Cut from 1 1/2″ x 3 1/2″ studs: Are actually common 2x4s(two by fours)….I am happy to be corrected. Wish i had of had this schematic before i built mine. Looks like my side monitors are to low. Thanks for posting! Sorry Ian! You might be able to raise them and just re-cut those panels? And if they look good for you, who cares! i have to be honest; not a builder or architect and can not really work out the measurements used in the schematic. if not asking too much would it be possible to have lenght measurements converted into cm ? Lenght of sections will do. it will make it so much easy for those like me .brought up on metrics measurements only. Good day mate and thanks again for the details. I have been trying to see if you’ve answered this before but not able to find it so – can you tell me why you ended up with a projector over say a 60″ Television or larger please? I am going around in circles and cannot decide 3 x 60″ TV or 3 x benq projectors. Congratulations on your great work, would it be possible to choose the SketchUp file? what is the base cost for your home sim? I have not calculated. I had to buy a PC, which was a lot. If you have a solid PC that can run three or four screens I would expect you could build it for less than $3,000 US and perhaps far less if you got a good deal on the avionics and projector. The lumber etc. was only a few hundred dollars, and I built it myself. Hi, I have a doubt about the real wide measurement of the MFD Panel. The sketch says it is 46″ wide. But if the entire front is 48″ wide, and we subtract 1.5-inches from both sides (the Two 1′ cuts, 1-1/2″ x 1-1/2″), then we end up with 45″ available to insert the panel between the two 11-1/4″ pieces. That means that the panel will not fit at all. Am I wrong? The panel is 46 inches wide. The base to which it is attached is 48 inches wide, same as the interior of the cabin. The cabin interior is 48 inches across. This leaves an inch on each side of the panel for the glare shield (which is made of 1-inch foam). Ok, I am clear now with your explanation. I am gathering the supplies to start soon the SIM project. I will use (2) 40″ Full HD Westinghouse TV’s for the side windows, but I would like to cut the windows in a way they don’t show the entire view at once, but in a way that you can look at it up/down/forward/backward and see a bit of deep view for a better realism. I hope I can accomplish this placing the 2-tv about 2 inches apart from the walls and hiding just a small portion of the tv’s in a way that they look like a window. I don’t have an Ultra Short Throw Projector, Instead, I have a new Optoma GX1080 Short Throw which I hope it can do the trick, probably with some tweaking. Can you tell us the real size of your projection screen (WxL)? I have a homemade screen of 4’H x 8’W, which I have not tested yet for this venture. I like your window idea. Let me know how it works. The projection screen is 100 inch on the diagonal. Not sure about the WxL but I’m sure it’s standard for a 16:9 screen and you could probably do the math easy enough. 1) How much of your 100″ is covered by your Short Throw Projector? I have no idea how big the projected image should be in order to get a proper or good bezel match with the two 40″ LED TVs. 2) Do you recommend using X-Plane 11 instead of P3D? I have P3D installed, but not X-Plane 11. ( I live in USA, Orlando, Florida so I wonder if X-Plane 11 have enough sceneries for USA. I will appreciate your comments and will follow up your tips, comments, and great videos. “Keeping the Skies Fun and Safe” !! Hi Martin. My projector covers the entire screen. Hello N15JG, hope all is well. I have the saitek gear now and will be using two 10″ androids on the dash with only 1 saitek instrument panel (destination unknown), unsure where to place it. I bought two 32″ tv’s for the windows, 1366×768 @ a nice price of $200 aud or $150 u.s. For the front I am wondering what you think about 55″curved 4k tv as far as size goes? Which is 49″ across. Given that one doesn’t want to be sitting any closer than 4′ from the screen. Obviously, the further back the screen, the surroundings around the tv come into play, which must not happen. So what are your thoughts at 4′ away and if it’s an issue maybe I could extend the quarter panel furher or what would you do? Also I like your apps on ipad but I will be using android. I think you have pilotedge loaded on a free floating ipad on most flights and I think it’s great for a beginner like me (I am in Australia too) but is it compatible with android or can you suggest apps for me to use. I will be using fsx with 8 orbx Australian addons included with my purchase ☺and I bought from REX, worldwide airports hd, advantage radar and essentials plus overdrive all on sale. Apologies about the novel but flying is a dream and in a sim, the right gear & apps will get me closer to taking real life lessons. I presume I will be setting up for a ceesna 172 primarily or 182? Any or all information will be greatly appreciated. Your videos are the easiest of videos to enjoy for myself, wife and friends. Thanks for the comment. In terms of the front view I think you need to go with what’s most practical for you. N343C here, just wanted to know what Cessna 172 model the instrument panel is from, I want to buy an actual glareshield so I don’t have to make it, but I need to know the exact model/year of the instrument panel and if in fact it truly matches the real life counter-part. Also, for my cabin I widened the actual panel by two inches. HI, do you actually feel like you are in motion while flying? I plan to build your setup for my little nephews. Thank you so much!! Sometimes I do. My wife can’t sit in it or she gets motion sickness. As N15JG says, sometimes you can feel a bit of motion, in special when making turns when observing the 2 monitors on the sides. I have (3) 24″ monitors in my simple cockpit (actually I am using just an office desk 🙁 ), and sometimes I do really feel that kind of motion. It is really a pleasant experience, and I think that having a cockpit in an enclosure environment like N15JG has, the realism must be awesome. I assume that that, for instance, the “to brace” measurement of 1′ 10″ is along the inside of the 4′ 10″ beam If so, the distance from end of the 4’10” lumber to the brace would be 1′ 11″.5. And similarly elsewhere. Am I correct, then, that all such measurements are “inside”? You mentioned that you used L-bracket s to brace the corners. Did you use these in, literally, every single corner (about 70 brackets) or just in certain “strategic” corners? I keep thinking up more questions as I move closer to getting started on my sim… can you tell me what you’re using for a floor? I notice you’ve carpeted, but there is no floor in the schematic. Also, it seems there is some sort of paneling at the front of the cockpit, can you tell me, please, what you’ve used for that? And finally (for now), do you happen to have the measurements for the glare shield foam and cover? There is no floor. My sim sits directly on our basement concrete. I used corrugated plastic for the wall panels, including in front where our feet go / below the panel. I covered it with leatherette. The glare shield is 1-inch high density foam about 9-10 inches deep, covered in black leatherette. Just thought of another question… how do you have your iPad mounted to the back of the panel? I am responsible for building a flight sim for a group of air cadets in the UK. I have a PPL and I think your approach to a flight Sim would be the best for them to experience as near as real a flight as possible. So I am planning to base it on you sim. My question is how did you secure the 32″ window monitors to the frame? They just sit on the frame base, and the plastic sidewalls hold them in place. I have been looking at 32″ monitors. I can’t source the same ones as you used but have used their dimensions as a reference. If I’ve got this right, your monitors are thicker than the wooden frame that supports them which would mean that the plastic sidewalls won’t lie flush on the frame but bulge out a bit. Is that right? Yes. If you watch the tour video on the YouTube channel you can see I cut out rectangular holes so the backs of the TVs had room to stick out a bit. Yo, I believe the whole thing is held together by L clamps/braces from your local hardware, same for the screens. I am so happy right now. I bought a 120hz 800motion rate 65″ screen for cost, maybe less :D.
It now lives on a low line (70cm high) unit. I am going to screw some wheels on all 4 legs so I can take it from the lounge room to the office and slide it right in front of the sim, once built. The bottom of the screen will be about 80 to 85cm from the ground once in place. Any thoughts on the height ? Ps. basement fly guy..Again, great work mate. Whatever height puts the horizon at eye level would be best. Sounds like a great setup. Very nice setup. What do you use for seats, and what is the height of them from the floor? Thanks. I just use some office chairs with the arms removed. They have adjustable height. Out of curiosity, what brand of ultra short throw projector do you use basementflyguy? Incredible simulator you have! Corey, please email me at ontheglideslope at gmail dot com. Thanks. 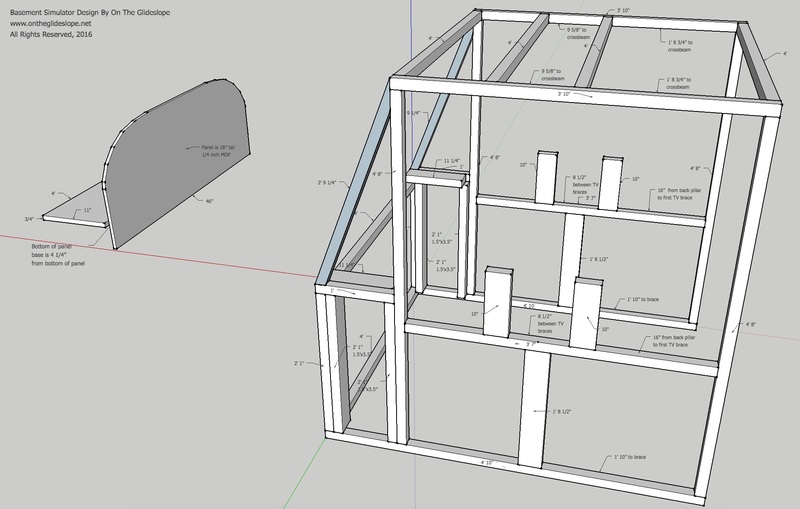 a tad wider though (150x150x100) but the sketchup looks more or less like yours. Could you make a CAD drawing of this. Hi, I’m sorry did you say how you attached the panel to the panel base? Is it with L brackets? Me and my son are going to be getting into flight sims after Christmas, and I have been absolutely wowed at the amazing level of realism you’ve been able to obtain with your home-built sim. I really enjoy all your videos and am learning a lot about today’s possibilities for realistic home flight simulation in preparation. We have to start small and build up over time. Thank you for your willingness to share what you’ve learned! Thanks Peter. I love stories like this and please let me know how I can help. 1- I think you said you were using an old iPad 4 for the 6 basic flight gauges. What size screen and what OS are you running? Air manager on the apple store says it requires OS 9 minimum, and I’m not sure I can get a used older iPad that is still compatible with that later OS. Side note: I wonder if it would be possible to use a micro “computer stick” with a slightly larger, used wide monitor. (Do you know of any cases like that?) Thus I could get the engine & nav gauges on this screen using air manager 3.0, It would be a lot cheaper to getting the 3 Saitek FIP’s, and allow for more configurations, but not sure if it would fit on the panel yet. There are always trade offs isn’t there! I know you are holding them in place with the coroplast panels, but resting them on the panel is concerning to me because TV’s are not really designed to take the load in that location and you could eventually wind up with a crack in the glass or damaged pixels over time. 3- What is ‘leatherette’ and “mauldrin” (the panel interior fabric)? I went to Joann’s fabrics and all I could find was brown and beige polyvinyl simulated leather. I know nothing about fabrics! Also, what did you use for the trim on the windows? I’m using Air Manager 3 for my gauges, but with an On-Lap 13″ IPS LCD (model 1303i). All eight gauges fit very nicely. The monitor is touch enabled if you like that sort of thing. The downside is that it is larger than the iPad. This particular display has a one inch bezel and I had to make some compromises to get it to fit next to the radio stack (Saitek) with clearance for cables while not being too far to the left or forcing the yoke down (very much). In fact, the upper left corner protrudes into the glare shield foam. A full scale layout is needed. I don’t care for touchscreen adjustments of heading, obs, etc. You can map keyboard keys for that but knobs are nicer. Fortunately there are plenty. If you are using Saitek radios, there are the two left displays when in the Xpdr position. If you have the Saitek autopilot, both hdg and crs (OBS) can be adjusted there. I have 4 fips, which means 8 more knobs available. The fip to the left of the gauges currently has knobs for dg drift and for baro. The one below the radio stack has obs1 and obs2. All the programming is via Spad.next. Hi! Great sim and you’ve got some great advice. Have you got a copy of this booklet?